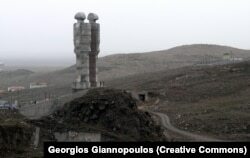 The two heads of the Statue Of Humanity lie in a municipal dump on the outskirts of Kars. It was intended as a gesture of friendship. But in 2011, a Turkish statue symbolizing reconciliation with Armenia was labeled a "monstrosity" by then-Prime Minister Recep Tayyip Erdogan and torn down. Today, a visit by RFE/RL to the eastern Turkish city of Kars reveals the statue dismantled and dumped among rusting vehicles 50 kilometers from the closed border with Armenia. In 2011, when the 30-meter statue stood mostly completed on a hilltop above Kars, there was fragile hope that Turkey and Armenia were on a path to reconciliation. The two had been hostile neighbors since mass killings that began in 1915 under the Ottoman authorities. Armenia and dozens of other governments and parliaments refer to the well-documented massacre, in which more than 1 million Armenians were killed, as genocide. Turkey, however, dismisses the word and stresses the turmoil within the Ottoman Empire during World War I, in which "people of all religions and ethnicities lost their lives." In 2008, Erdogan made Turkey's official stance bluntly clear when he announced, "We did not commit a crime, therefore we do not need to apologize." But there was some cause for optimism. In 2005, an Armenian church in the Turkish city of Van was restored. Then, in 2009, Armenia's president attended a soccer match in Turkey. They were small but emblematic steps for two bitter neighbors whose closed border has stifled trade in one of the poorest regions of Turkey. A photo from 2011 shows the doomed statue on a hill above Kars. In 2006, Naif Alibeyoglu, then mayor of Kars, told visiting anthropologist Oguz Alyanak that the Statue of Humanity that he had commissioned was "his dream." The monument was to depict two halves of a human figure, each extending a hand toward the other: a symbol that Alibeyoglu said would bring together the "brothers and sisters" of Armenia and Turkey after decades of rancor over the mass killings. Turkish artist Mehmet Aksoy, whose family is of Armenian descent, was set to create the monument. But, as he explained to RFE/RL by telephone, while he oversaw the statue's block-by-block construction, there were three forces brewing into a storm that would soon destroy his work. "First, the very religious consider any statue idolatry and un-Islamic," he said. "Second, it was close to the elections and the AKP [Erdogan's ruling Justice And Development Party] wanted to appeal to nationalist and Islamist voters. Finally, the Azeris" -- whose country is locked in a territorial dispute with Armenia -- "and their president were apparently upset about the statue; [Azerbaijani President Ilham] Aliyev apparently called Erdogan personally and asked that he remove it." On April 26, 2011, Aksoy watched demolition workers slicing into the concrete necks of his statue with a diamond-tipped saw -- a sight Aksoy described as "like watching my children being beheaded." But tragedy soon slipped into a complex farce after Aksoy sued Erdogan over his use of the word "monstrosity" to describe the monument. Aksoy won the case and was awarded around $3,800 but, as he told RFE/RL, "I didn't want to put this dirty money into my art, back into my stone. So I spent it. I decided I would spend this unclean money on a party with friends." But by publicly describing the money as "dirty," Aksoy raised the ire of the famously litigious Erdogan, who was by then president. In 2015, Erdogan sued Aksoy for allegedly implying his earnings were illegitimate. The case is ongoing. In Kars, few locals realize the slabs of concrete, guarded by a motley collection of stray dogs on the outskirts of town, was once a symbol of hope for the small movement within Turkey that seeks reconciliation with Armenia. When shown RFE/RL's photographs of the statue's final resting place, Alyanak described the images as "heartbreaking, though heartbreak has become a feeling some of us in Turkey have gotten used to lately." Aksoy knows about the scruffy resting place of his broken statue but is unfazed by what he sees as a temporary indignity. Through yet another pending court case, this one lodged with the European Court of Human Rights, he hopes to win the right to reconstruct the statue. "If I win that case I will rebuild my statue piece by piece, in exactly the same place it was before."